Happy weekend everyone! Today I wanted to share another "Basics" tutorial that I've gotten several requests for over the years. For some reason, I never got around to making a contouring how-to before but I finally have one here for you today! Yes, this rather simple method to making your face look slimmer without plastic surgery, dieting, exercise, or great lighting is a wonderful trick to have for any "looking extra awesome" occasions especially when you know you will be in the spotlight where a lot of photos will be taken. Check out the video below! 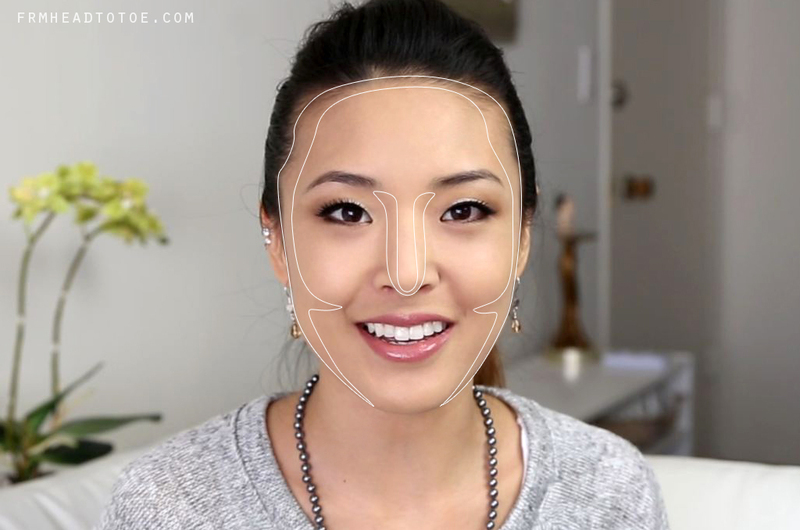 To see as a quick guideline, here is an illustration of the basic areas that I contour. If you think about how sunlight would naturally hit your face, contouring falls where the shadows are so by adding darkness we are in essence bringing out the forehead, nose, cheeks and chin. The biggest tip I can give with any contouring is to use a light hand, especially around the nose area. You can always add more if it doesn't show up enough but it is much harder to hide when you've added too much and your nose starts to look dirty instead of slim, sleek, and naturally straight! Also, blend, blend, blend out any harsh edges so it really looks like shadow and isn't distracting. I hope you enjoyed the tutorial and that it helps for those of you who were interested in contouring. I really want to make doing these basics lessons a priority since it seems to be one of the most helpful types of tutorials I've done so let me know in the comments if you like them and what basic you'd like to see next! Readers, are you a regular contourer or bronzing newbie? What is your favorite bronzer? Let me know in the comments! Love love love your Video! I have never contoured before! O_o;; It's kinda scary to me lol! I have never tried it because I never felt I needed to? I suppose if I did and saw the differences I would probably join the bandwagon. This is so helpful! Great post. For contouring, do you need to use a lot of product or are you suppose to use just a little big? I just found your channel on youtube and I love your videos by the way! that makes sense! I usually overdue it when it comes to foundation and stuff like that, but I don't want my contouring to look fake! You can really tell the difference it makes though it looks natural! Great tips! :) Just wondering, what software did you use to edit this video..? I've tried matte eyebrow power and it works great on my nose! I also loved your acting in Phil Wong productions! Honestly.. I'm still learn how to blend, so I can have a natural look when I contouring my face.. still hard for me to blend out a harsh edges.. I already bought NYX Highlight & Contour Powder, but I don't think the shade is suit with my skin.. =( It's to dark for me.. Thank you so much for the tutorial! I've been quite confused about contouring. Also, I have a bit of a crooked nose which is crooked towards the right. How do I contour this to make it appear more straight? will you do tips on makeup for dry skin? i'm trying to find good foundation/concealer for my skin but it always end up a bit cakey because of my dry skin. I do use moistrizers and it's fine at first, but always end up cakey after a few hours. Have you tried using setting sprays? There are a few that are hydrating like MAC Fix+ that can "refresh" and rehydrate your face throughout the day, and also removes the powdery look after using setting powders too! Thank you so much for this video! I found it extremely helpful. I also really appreciated your bronzer suggestions as I believe we are of similar skin tones. I emailed you a long time ago about the round lenses that you had on your youtube page. I just saw your blog again and I love that you did the contouring! There is a very cheap contouring compact that I have found to love. I have found it was hard to find a dark enough bronzer without it being really shimmery. E.L.F makes a REALLY great contouring palate that has blush and bronzer. it stays on your skin all day and you lasts forever! you should definitely try it and see how you like it. It is about $3 I believe at walmart, target, etc. Awesome video jen! Do you ever use NYC bronzer? I've heard amaaaazing things about the NYC bronzer but, not kidding, every time I go looking for it it's sold out. I'm still on the hunt though! Was wondering if you ever tried Josie Maran's Argan Brightening Bronzer Sun Spot Corrector? I find it slightly cool-ish in colour, but still works great for my light/medium asian skin. It's so buttery and pigmented you need to have a light hand. It's matte, but gives this lovely glow to the skin - it was the only bronzer I used all last summer! another great video!! I'm going to go home and try your techniques. My Sigma Paris palette arrived yesterday. You look amazing in the photos (as per usual) and your shade triomphe is a triumph!!. Peace and Blessings. I was just wondering, would you recommend others buying Sigma brushes separately or as in a set? Do you think every single brush from the kit are worth it? i'm sooo tempted to buy the Sigma brushes! Thanks for the great tutorial Jen! You truly simplified contouring and I loved the results! One thing-my jawline looks noticeably darker than my neck. Should I apply the bronzer on my neck too? Hey Jen! Love your tutorials! My problem is that my nose is uneven.. I have a deviated septum (not sure if that is the proper translation) and my nose is sided to the left. Can you teach how to camouflage that? Can you also recommend a more affordable product? Thank you! 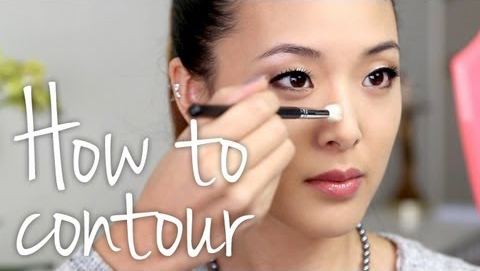 jen, would you do a tutorial of your eye makeup in this video? would really like to see how you used the basic palette. thanks! I always have a lot of trouble applying the contour to the sides of my nose. It always looks a bit dirty around that area, but I don't have the same problem with the hollows of the cheeks.. I'll try to do more looks with the Naked Basics! When applying makeup, do you suggest people to apply makeup in a bright room, medium, or dark room? My room is medium light and I just notice that when it's out in different places, my makeup is really bad. Help. Definitely a bright room! Natural light is best if it's available. apparently everyone is going CRAZY over the too faced chocolate soleil bronzer. your thoughts on it?? Since contouring is to achieve the look of a high-bridged nose. I see where it can be straightened when you look at the bridge straight on and add color just to those areas. I like to see how you used the basic palette. All these videos are very helpful. i will try these myself at home. Have you done a tutorial with the look you have on your eyes? I did a search but couldn't find one. Ps - I'm going to Korea in April. I'm going to stock up on BB cream but is there anything else you'd recommend? heey Where can you find your earring you are wearring on this video?? Hey Jen! Please do a tutorial with this UD Naked Basics neutral eye look. It looks really great & there have been many other requests for it too :) Thanx! Hey Jen! Please do a tutorial with your UD Naked Basics palette for this beautiful neutral eye look. There have been lots of others who've requested it too :) Thanx!